Light and Space pioneer Helen Pashgian at her 2014 LACMA exhibition. The artist has been an integral part of the Los Angeles art world for decades—beloved by curators, critics and fellow artists. I am three minutes late when I arrive at Helen Pashgian’s studio, tucked in a parking lot off an unremarkable Pasadena alleyway. Before I can knock, she opens the door—tall, lithe and emanating an elegance that is at once immediate and understated—and ushers me in to her dimly-lit studio. She has just returned from the Sun Valley Writers’ Conference, at which she is a regular attendee, and is telling me about a previous year’s talk given by late American diplomat Richard Holbrooke on the political and economic complexities of Russia’s 2008 invasion of Georgia and its relationship to the Saudi Arabian oil pipeline and the Strait of Hormuz, in the Persian Gulf. I quickly realize this is a studio visit unlike others. We enter her workspace and I find our seats are arranged, waiting for us: two directors chairs opposite a single disc of quietly luminescent pure green color. Throughout our hour-long conversation, which I am not allowed to record, I alternate between trying to write down everything Pashgian says and giving my full attention to her words. Phrases from my notes include: “out of time and space,” “reaction to the world in which we live,” “California as melting pot,” “a space where words are no longer sufficient,” “dissolution,” “memory,” “DeWain,” “Wheeler,” “Bell,” “Mary,” “Peter,” “Turrell,” “internal journey,” “how light travels through color,” “the light is the object.” Such fragments reveal enough of Pashgian to situate her clearly within California’s Light and Space movement. Yet any words, I think, are insufficient to capture the sentient experience of her work or the significance of her discoveries within the history of art, color and light. 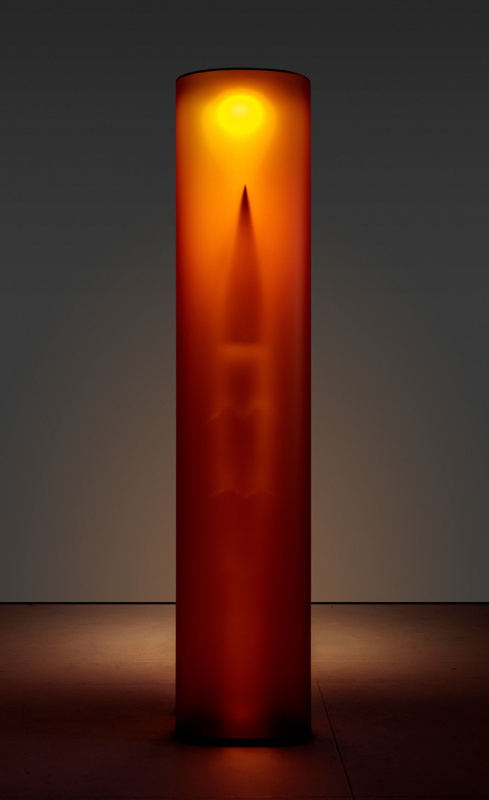 Pashgian’s Untitled (orange), 2009. Photo by Josh White. Image courtesy of TOTAH. Trained as an art historian with a focus on the Dutch Golden Age, Pashgian’s reverence for Vermeer, aka the painter of light, has been fundamental to her thinking for more than 60 years. She made paintings for a while after returning home to California from her studies in Boston, but eventually gravitated toward more experimental materials, such as a polyester resin so toxic it has since been banned. While her media have changed throughout the course of her career, her insistence on light as the object of her work has not wavered. For Pashgian, light is not a metaphor or a symbol or an allegory; light itself is both medium and message. Pashgian is rare among artists for many reasons—one of which is her willingness to talk about nostalgia without irony, distance or dismissiveness. She has spoken about a particular nostalgia in her life, one that she relates to early childhood memories of playing in the tidepools along the California coast and watching the way light moved through the water and animated the creatures below the surface. Something about her description of this reminds me of the Portuguese word saudades, which I mention to her, explaining that it has no direct English translation but is more or less a sense of longing for something indescribable. She tells me to write that down. When I think our visit is coming to a close, Pashgian instead leads me by the arm to a different darkened room in the building, imploring me to keep my eyes averted from everything around me except the Eames roller in which I am to sit. I find my way to the chair looking down, cover my eyes with my hands and unlike every other instance in life when I’ve been told not to look, I actually don’t. I’m aware that I’m smiling, though I don’t yet know what is going to happen. It feels like a long time before Pashgian says I can open my eyes. When I do, it takes a few minutes to process what I am seeing: a glowing circle of yellow, undefined by the space around it, seems to float before me. The lights in the room are low but not completely off, and it’s almost as if the color is gently pulsating or breathing. My eyes and brain are unable to reconcile what is before me and I am completely transfixed. Pashgian’s Untitled (white), 2009. Photo by Josh White. Image courtesy of TOTAH. At some point, Pashgian seats herself next to me and I can feel her anticipation. She is waiting for my response, but I can’t summon any words. After a few minutes, she hits my arm with a lack of restraint that is both surprising and charming. “Do you see it?” she asks. Eventually I tell her that it feels like what I imagine it would be like if we were able to look directly at the sun—something we are aware of everyday, but can never truly see. It’s not so much a visual correlation with the sun that I am experiencing, although that is present, but more a sense of seeing something beyond the limits of physical capacity. Pashgian tells me to get closer, so I stand up and walk around the epoxy disc in disbelief at the fact that this seemingly ethereal orb of color is actually the result of immense human labor and precision. Pashgian resists a spiritual reading of her work, an understandable position for someone whose practice requires scientific acuity, high-tech material and skilled fabricators. Yet being in her studio was, for me, undeniably transcendent—the sort of experience that simultaneously heightens one’s awareness of physical existence and blasts one beyond of the limits of that physicality. “It’s what you feel when you have that internal flux that comes from a moment of awe,” says her New York gallerist David Totah, whose eponymous Lower East Side gallery included Pashgian in “Transient,” a two-person show last year. Pashgian’s Untitled, 2012. Image courtesy of TOTAH. This season, a series of Pashgian’s columns and spheres feature prominently in London at the Hayward Gallery’s “Space Shifters” exhibition on view from September 26 through January 9, 2019. 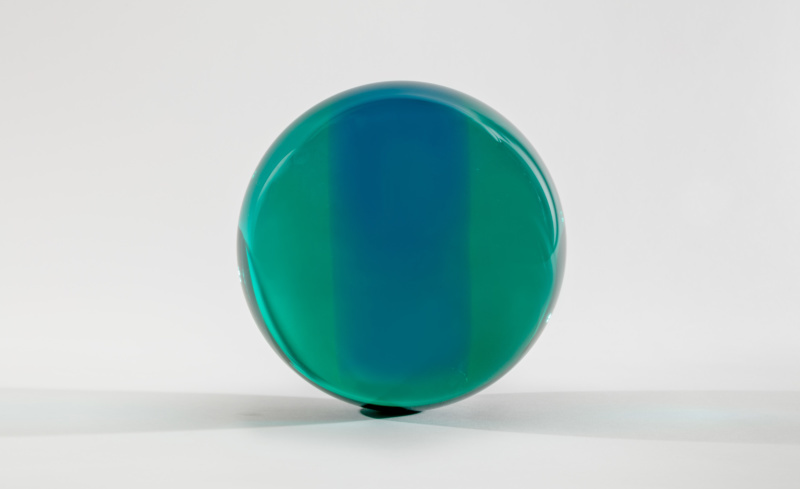 TOTAH is also including Pashgian’s first-ever black sphere in “Polarities,” a group show through October 14 that proposes to showcase the way in which color can destabilize contrasts. It’s a fitting context for the artist: our conversation made me think of Isaiah Berlin’s “Roots of Romanticism,” in which the philosopher traces the transition from the Enlightenment belief that all knowledge is attainable if one asks the right questions to the Romantic notion that the universe is inexhaustible and infinite. While it is tempting to think of Pashgian’s work as a sort of Romantic ideal—with its saudades and its ethereality—to do so would be a denial of the fundamental rigor of her practice. In Berlin’s text, he summarizes the Romantic position: “If the universe is a form of activity and not a lump of stuff, if it is infinite and not finite… how can we possibly try to describe it?” He continues, “When we try to describe the light we can describe it accurately only by putting it out. 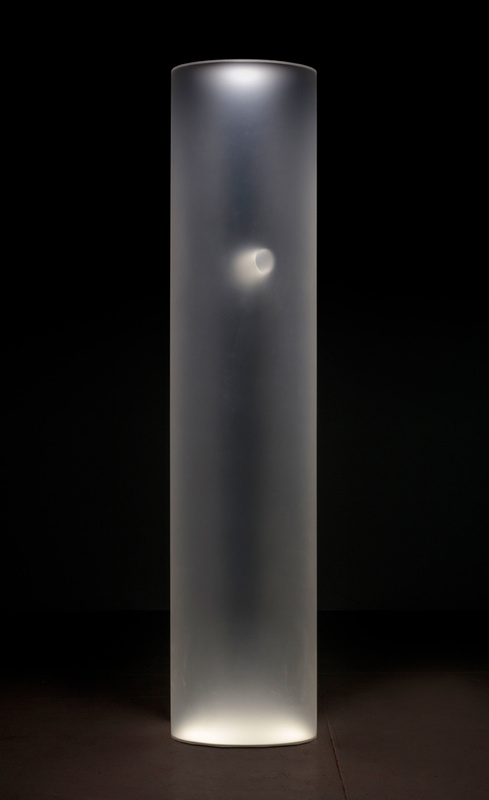 Therefore do not let us describe it.” Pashgian’s discs and spheres and columns composed of light itself put forth the possibility that we are not limited to description in art, or in life. “Space Shifters” is on view at the Hayward Gallery through January 6, 2019.